The 350 ton hydraulic press featured in this video was specifically designed for die cutting full hides of leather. SCHWABE USA Straight Ram Hydraulic Beam Press with InFeed and OutFeed Conveyors for Full Hide Leather Cutting. 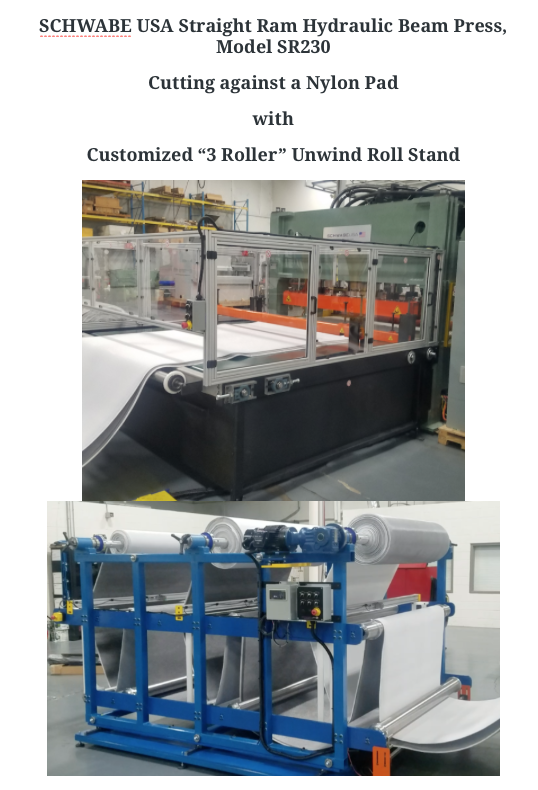 The SCHWABE Roller Press is the ideal machine to die cut natural or synthetic materials, such as leather including half and full hides, cloth, cardboard, composites, and gaskets to name a few. With the simplicity and purity of the Herman Schwabe based design, this EXTRA Heavy Duty SCHWABE Roller Press can be operated by a single operator for a single operating station or up to twelve operating stations with operators depending on production needs and requirements. Daylight Opening: ¾" - 7"
Programmable Height Settings: 3/4" - 7"
Infeed / Outfeed Support Tables: 96"W x 108"L x 36"